Nocturne 2018. I biked it. It rained. I blew a tire. In September 2004, Artforum published a paper Glenn Ligon mistakenly prepared and delivered for his part in a College Art Association panel on the artist David Hammons. The resulting text, “Black Light: David Hammons and the Poetics of Emptiness,” is a gift to anyone considering the ways in which contemporary art connects with people’s lives when it leaves the gallery and goes out to occupy other spaces. 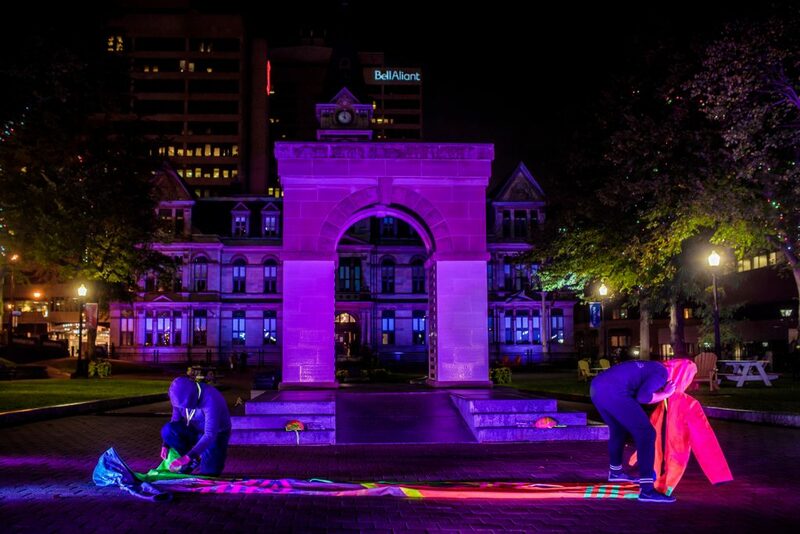 “Black Light,” was fresh in my mind when Visual Arts News editor Shannon Webb-Campbell asked if I would write a blog post about this year’s Nocturne events and has stuck with me as I took her up on it. Before what we’ve come to call “Nuit Blanche” or “White Night” style events spread to Turtle Island, they started in Europe with events such as the Helsinki Festival’s “Night of the Arts” in 1989 and the city of Nantes’ six-year project “Les Allumees.” The latter invited artists from a different city each year to share one-night projects in Nantes between 1990 to 1995. The name “White Night” seems to have first cropped up to title St. Petersburg’s first art at night festival in 1993. Coincidentally, that makes the name “White Night” only as old as this writer. In 2002, Paris launched its white night event, giving the world the title “Nuit Blanche.” Nuit Blanche reached Canada via Montreal in 2004. 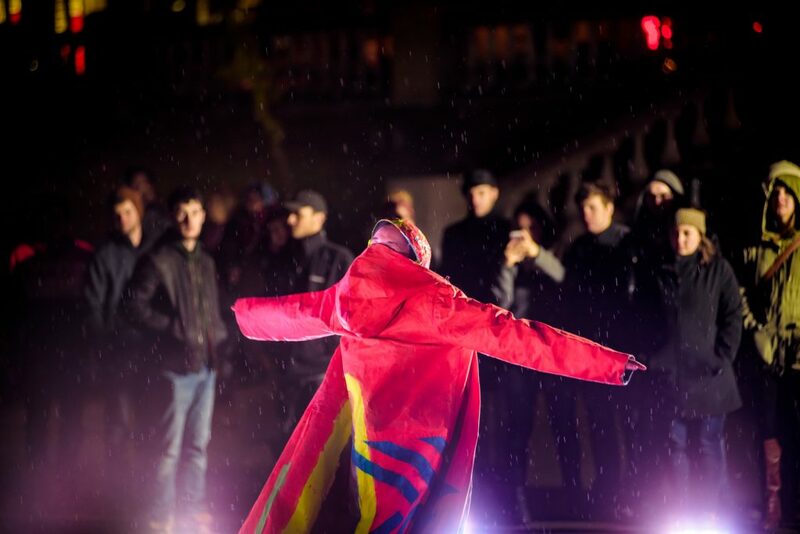 Toronto held its first Nuit Blanche in 2006, and in 2007, when Rose Zack, Laura Carmichael and a remarkably small group of volunteers set out to bring a nuit blanche style event to Halifax, the name “Nocturne” was chosen instead. 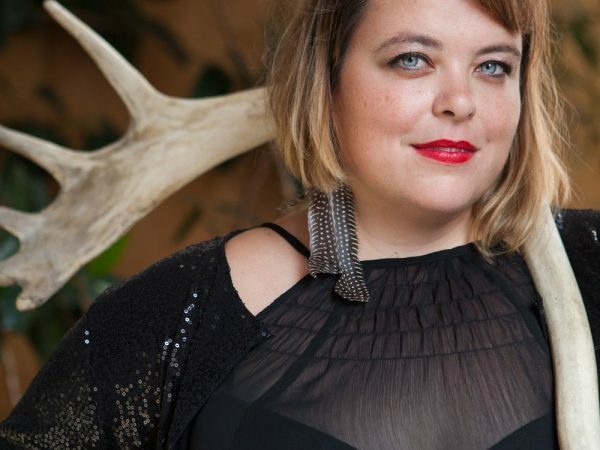 This year was Nocturne’s eleventh edition, marked by a partnership with the Aboriginal Curatorial Collective, who helped select Raven Davis as Nocturne’s first Indigenous Curator. 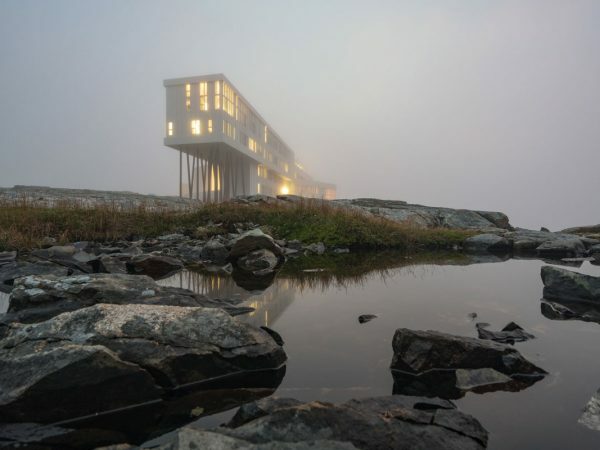 Davis, in turn, selected this Nocturne’s theme: Nomadic Reciprocity, a multilayered reflection on what is given and what is taken as we move through space, and as we move here in Halifax over unceded and unsurrendered Mi’kmaq territory. The encouragement of Davis’ theme had a profound impact on the makeup of the festival. Projects took a smaller scale; opting for thoughtful, political content over bright lights and visual impact. The body – its weight, its histories lived and inherited, and how its race affects its experience took centre stage. Performance work by Brian Solomon (Red Flag), Maria Hupfield and Jason Lujan (Double Shift, and There Is No Then and Now, Only Is and Is Not), Ursula Johnson and Angela Parsons (L’nuisimk: El-noo-we-simk: Speaking Indian) and Leelee Davis, Lisa Gambletron and Dayna Danger (That Which We Cannot Own) prioritized the presence of Indigenous bodies in the festival. As I witnessed their performance, Danger, Davis and Gambletron spoke similarly in metaphor and laboured with their surroundings. 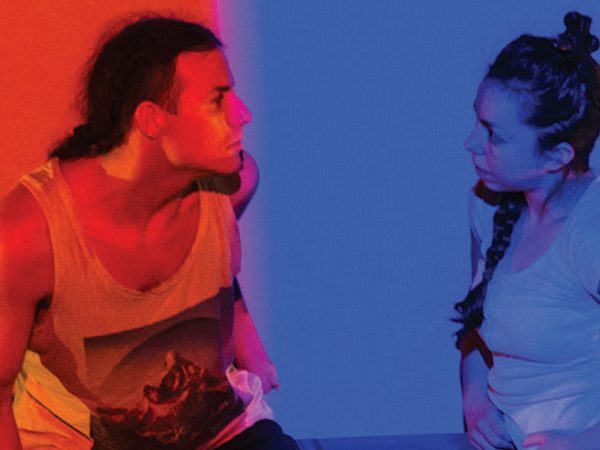 In a black box theatre, they had staged with mics, projections, props and structures, they took turns uttering phrases that could have been sarcastic; could have been ironic; and could have been directed at either each other or the audience. “I need help. Can somebody help me? Please! I need to clean up this mess. I am trying to clean up this mess. I don’t know who made it. But please, can somebody help me clean this up?” said Danger. “We’re being good guests! Let’s be good guests, Danger! We’re just being good guests!” said Davis. 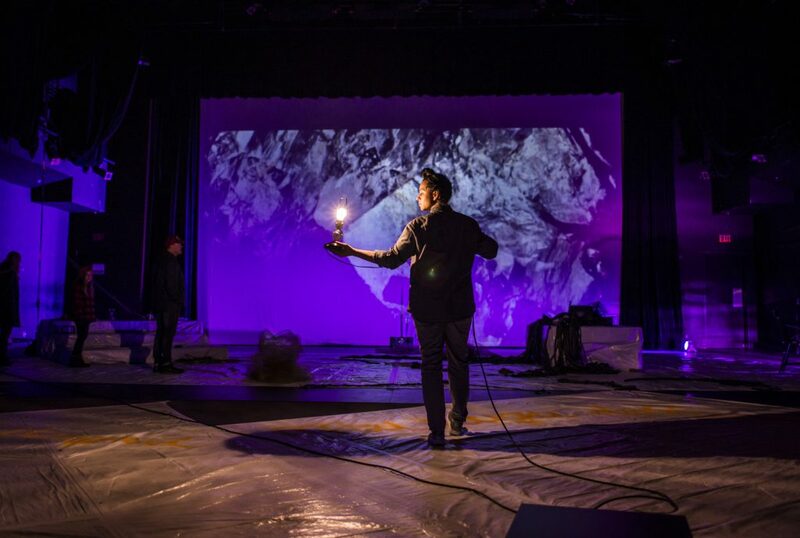 Their props: leather, bones, tarps, drums and images of water protectors gave poignantly veiled reference to the colonial implications of their actions and dialogue. With great subtlety they depicted the difficulty itself of standing up and speaking to Canada’s colonial history. 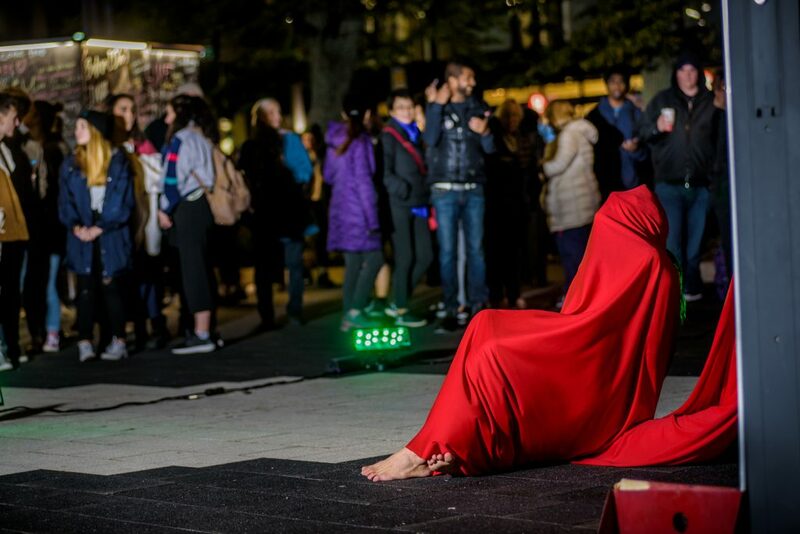 Similarly, Brian Solomon’s Red Flag, veiled the body of a performer with fabric hung from a flagpole in order to open up a multitude of new readings. Not the least of which being a powerful evocation of the bodiefs that have historically and today continue to disappear under the sign of the Canadian flag. Although, Ligon is speaking about a generation of black American artists who have since taken centre stage in the American art world, his articulation, “walk the threshold between a dematerialized and a historicized body,” resonates with the projects in Nocturne this year. This seems especially resonant with Hupfield and Lujan’s There Is No Then and Now, Only Is and Is Not a single channel video set up outside the Old Memorial Library. The street lights were turned off overhead, and a single projection played the video from behind a screen. The work asked viewers to consider something that many may not have before: the experience of Indigenous peoples with black bodies. 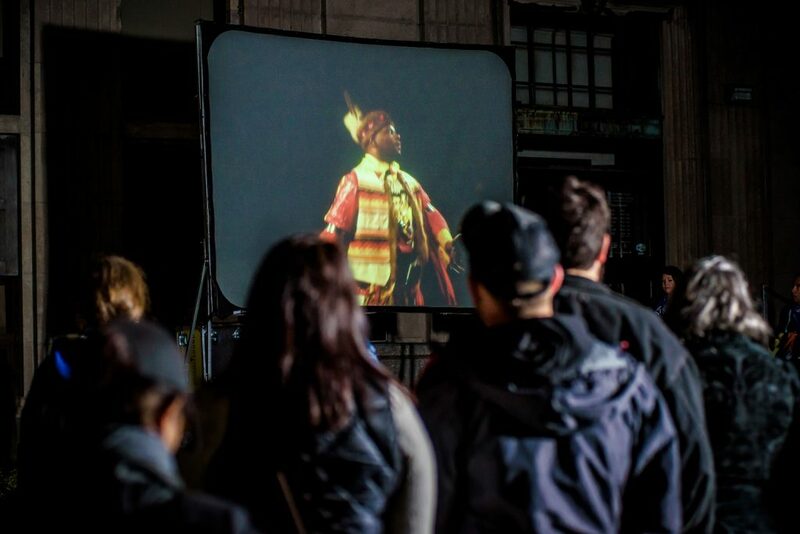 The video alternated between an artist, Dennis Redmoon Darkeem dancing in regalia in a darkened room and black screens with white text showing excerpts of a conversation with Darkeem about experiences and confrontations he has had as a black bodied Indigenous person. The video shares as we listen in silence and watch in the dark. In front of this work it’s the audience that disappears. Reading puts us in our bodies, potentially, recalling the histories in ourselves as we read about Darkeem’s: the building blocks of empathy. If you look long enough, you notice in the video of Darkeem dancing, Hupfield and Lujan have blocked out all of the light in the room except for a spotlight on Darkeem and a red ‘EXIT’ sign overhead. Like “Black Light” that ‘EXIT’ light has stuck with me. As if the video is reminding us that we can leave at any time. It makes me think about where I am: K’jipuktuk, Mi’kma’ki, but also a darkened patch of government property, open to an otherwise brightly lit city. It makes me think about the moment when I will turn and walk away from the video. When I exit and when I stop listening. Making the choice to stay and listen more conscious. That feeling of being made aware of when I leave, made me come back to Hupfield and Lujan’s installation at the end of the night. When I did, there were more people there than I’d thought. Still listening in the dark. Ryan Josey is an artist and writer based in K’jipuktuk (Halifax, Nova Scotia). Rose Zack invited him to volunteer with Nocturne in 2011 and he has been involved with the festival each year since. Follow him @ryryjo on Instagram.